The Bariatric 250 has been purposely built to cater for larger users, with a weight limit of 250kg. This chair is perfect for those needing to spend extensive amounts of time sitting down. You are supporting an Australian made product when you purchase the Bariatric 250 Heavy Duty. 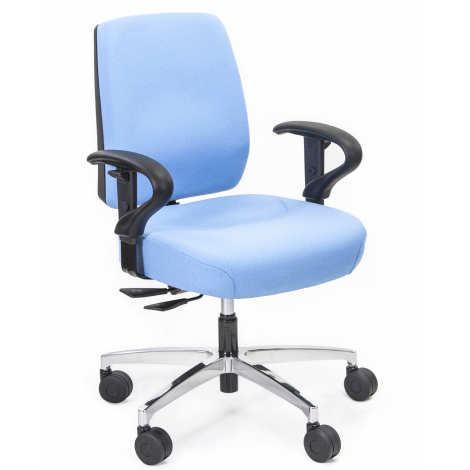 Operating with a one-click ratchet system and a 3-lever mechanism, you can effortlessly adjust your seat. Comfort and stability go hand in hand with the Bariatric 250. The chair comes with heavy duty wheels and a reinforced base. A polycarbonate reinforced back will ensure your posture is properly supported throughout the day. Your quality is guaranteed with a 5-year warranty for the Bariatric 250 Heavy Duty.